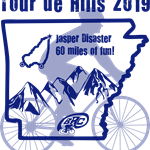 The Tour de Hills Road Race & Tour takes place on the famed “Jasper Disaster” course through Northwest Arkansas. Mile for mile, this Ozark route is one of the most difficult in the state, with some 316 turns in 56 miles. The route is extremely steep and strenuous but also very rewarding. The trade-off: it’s one of the most beautiful rides you’ll ever experience with jaw-dropping views from scenic overlooks and multiple chances for wildlife sightings, including the famous ELK HERD in Boxley Valley. Beginning in Harrison, take Scenic Byway 7 south 18 miles to Jasper, Arkansas. From Jasper, travel west on Hwy 74 to Ponca, Arkansas. Then take Hwy 43 north back to Harrison. The route is extremely steep and strenuous but also very rewarding.